Writing in approximately 700 BCE, Homer’s epic poems describe events dating somewhere between 1300-1200 BCE. Seeking to retrieve the Spartan Queen Helen who had run off with Paris, a consolidated Greek force lay siege to Troy for 10 years. Fighting spilled over into the surrounding region with little progress in sight. Finally treachery turned the tides. Feigning their departure, the Greeks constructed a massive horse as a tribute of thanks to Athena. Believing it to be a gift, the Trojans brought the horse inside their impenetrable city walls and out jumped Greek soldiers who opened the gates and allowed their forces to overwhelm and slaughter the city. The real drama of the story of Troy comes from the heroic battles of honorable Hector, courageous Ajax, and fierce but petulant Achilles. In fact, these warriors all died before the fall of Troy. Poseidon, Aphrodite, Athena, Apollo, and Hera appear at various points to help out their respective sides in the conflict. The Iliad also gives us several notable scenes and characters reproduced throughout art history: the Judgement of Paris, the Death of Laocoön, the ignored prophetess Cassandra, and the fruitless siege of the incredibly fortified city of Troy. 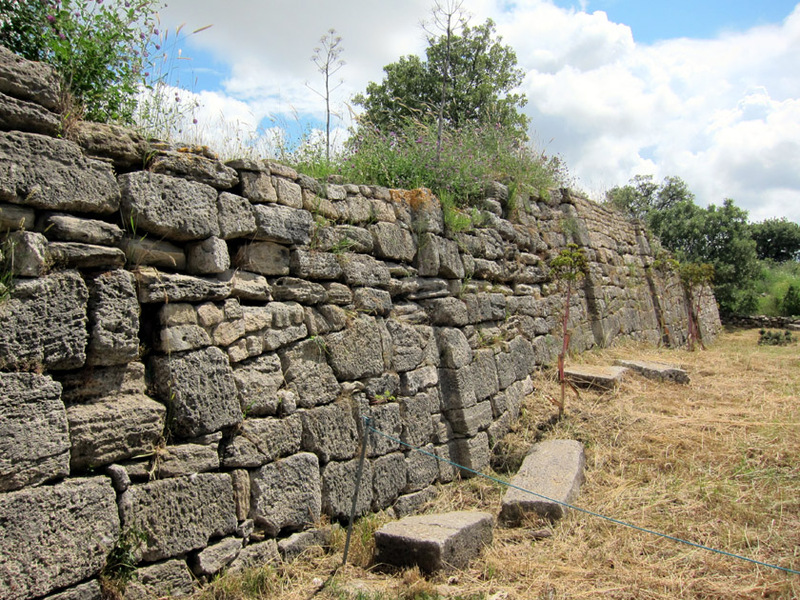 Outer city walls of Troy which date to the Troia VI period (1300 BCE) and the time of the Tojan War. Given Homer’s description of Aegean geography, “modern” explorers quickly pinpointed the northwest Turkish coast as the possible location of Troy. 18th century travelers wandered through the inland areas and eventually zeroed in on the unassuming but peculiar Hisarlik Mount, just outside modern day Çanakkale. Heinrich Schliemann (famous for his excavation and blatant exploitation of Mycenae) co-led the first dig from 1871-1894 and eventually decreed this site to be the ancient “citadel of Priam”. The location was not widely accepted as Troy until the Tübingen University excavation from 1982-1987 which extended into the silted in ancient harbor. This investigation found more layers of history than any other and clarified the story of Troy’s past. 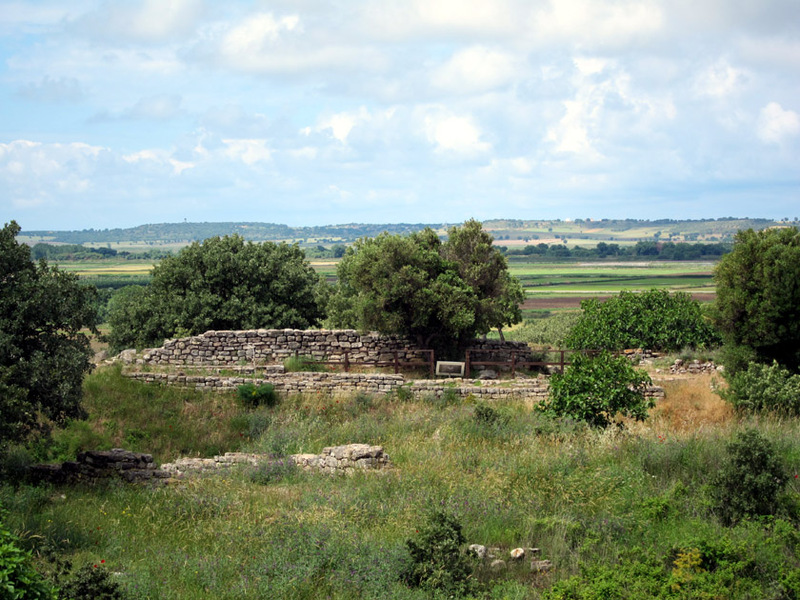 Archaeologists found that “Troy” (also known in Turkish as Troia) had been continuously inhabited for approximately 4000 years. The population could be divided into 9 distinct periods (Troia I – IX) which each gradually grew over each other and extended the mountain fortress. Mostly given the age and extended period of human inhabitation on this site, Troy has been recognized as a UNESCO World Heritage Site. The ocean around the coastal city of Troy has since silted in and receded which has left the archaeological site 6km inland today. The archaeological site today is fascinating because you can see each of these historical layers laid over each other. Several vertical excavation shafts reveal portions of each Troia showing how one settlement basically built on top of the last city. Partial excavation shows the layers of settlement and reconstruction. Small signs denote the elements of Troia IX, IV, and III. Troia I was a modest Bronze Age settlement built directly into the bedrock of the mountain; Troia II constructed the first substantial city walls but also appeared to be mostly a maritime community. 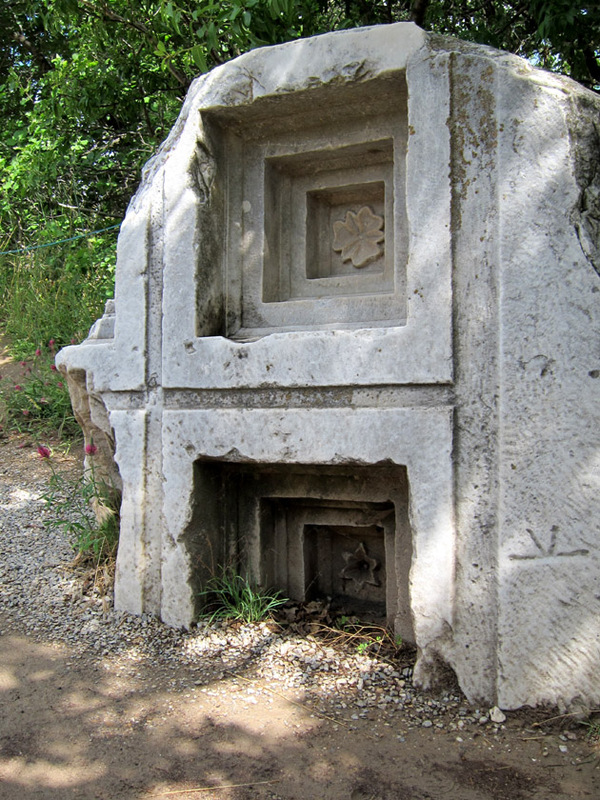 Troia IV and V were culturally Anatolian based on their artifacts. Amazingly, the artifacts that Schliemann found date to the earliest period of the city’s history (Troia I and II) and were much older than the city described in Homer’s texts. Much like many Greek cities, the Romans took over Troy and so Troia VIII and IX constitute a period of Latin control. 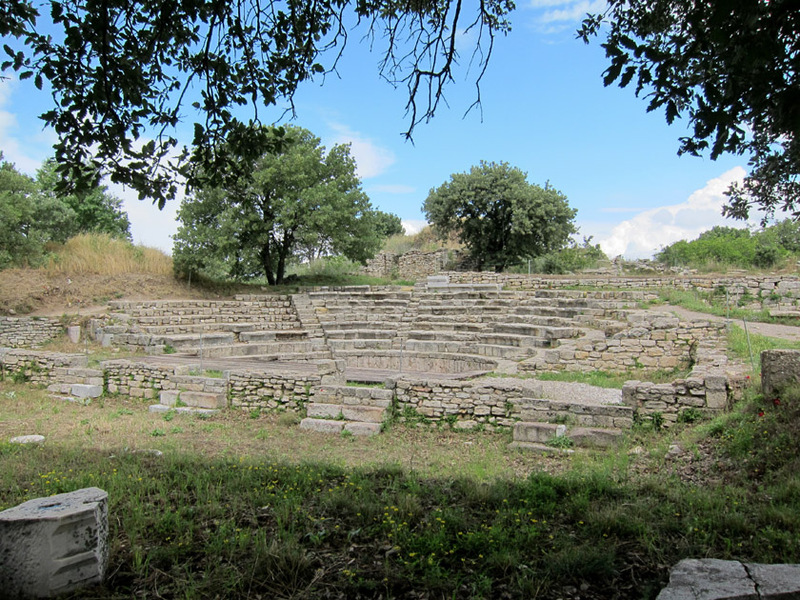 The city gained an small theater, roads, and other Roman elements. Remnant of the coffered ceiling from the Temple of Athena which dates to Roman Troia XIII/IX. Troia VII (1300 – 950 BCE) represents the zenith of the city. Notably during this time a massive protective wall was constructed, complete with guard towers. Troy VII is believed to have a population of 5-10,000 people. If you believe the archaeological site to be the legendary city of Troy, then this is no coincidence that an advanced city existed during the period of the Trojan War. 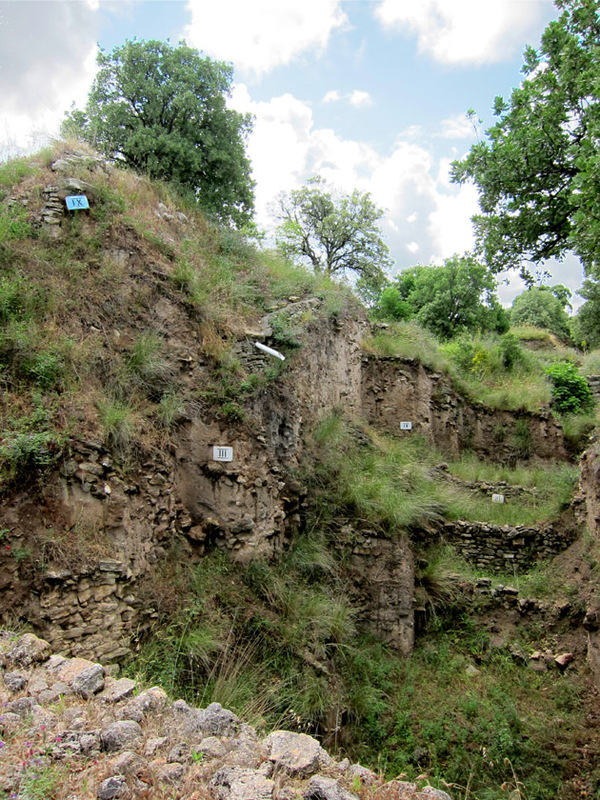 The archaeological remains do show that Troia VII was destroyed violently. There is evidence of extensive fire damage. Human remains were found in dwellings and in the streets indicating rapid death and destruction such that all victims could not be buried. Supported by the legend, archaeologists identify this traumatic event as the Greek randsack of the city. Others assert that an earthquake (which are common in this region) could have also damaged the city infrastructure and led to fatal fires. 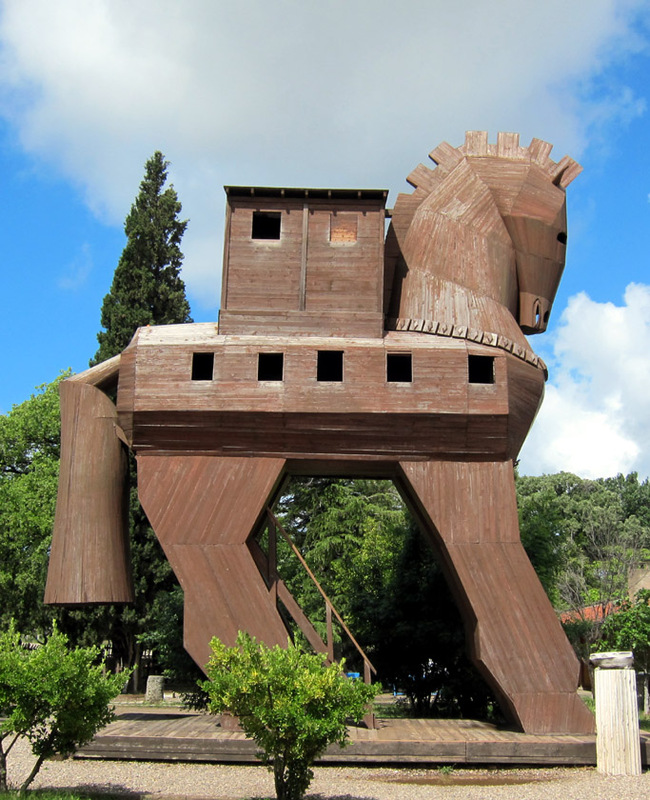 Visitors can climb into this “Model” of the Trojan Horse beside the entrance to the Troy archaeological site. It’s fascinating to think that Homer’s Troy could have actually existed and that archaeologists have in fact found it. So many legendary events and places of the ancient world survive in the written record alone. Certainly we can’t possibly confirm if Achilles, Helen or Hector were real. They may only be literary inventions to support an actual war story or minimally to offer an explanatory tale for the wholesale destruction of a Mediterranean metropolis. Mythology, the interference of the Gods, and the Trojan Horse aside, we do know that a great city in Turkey was utterly destroyed in about the 12th century BCE. Pal & Lydian of Art Weekenders – Do Folklore and Folk Art Have a Place in Modern Society? © The Daydream Tourist, 2011-2019. Unauthorized use and/or duplication of this material without express and written permission from this blog’s author and/or owner is strictly prohibited. Excerpts and links may be used, provided that full and clear credit is given to The Daydream Tourist with appropriate and specific direction to the original content. For permission, please send a request using the contact link at the top of the page.